The TU Delft Library is the largest technical scientific library of The Netherlands. However, the Library is more than just a library. After being renovated and turned into a Library Learning Centre in 2010, TU Delft Library has become a place for study, research and the exchange of knowledge. With inspiring spaces, places to relax and stimulating activities, emphasizing the fact that we at the university library are embracing the future and that we are an indispensable link between education and research. The unique building of TU Delft Library is a design by Mecanoo architects. It is not just a building, but also a landscape. The grass is lifted up at one corner and supported by columns. The central hall that is created by this effect has glass facades. The slope is interrupted by a shallow set of steps, leading to the main entrance. 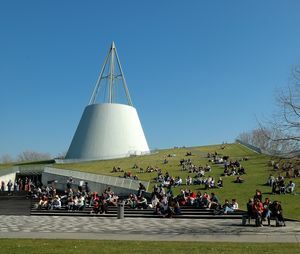 An enormous cone prizes through the grass roof, providing room for round and introvert study spaces, and symbolising technology. Our books are displayed in an immense book wall, stretching from ground level up to the fourth floor. The location of books, journals and computers is coordinated with the path of light. The building is energy efficient. The grass roof has an insulating effect and reduces large changes in temperature. The vegetation retains the rain water. Slow condensation of this water creates natural cooling in summer. It also provides excellent noise reduction. We do not have ugly cooling machines on the roof. Our cold storage is in the groundwater. This keeps our building nice and cool or warm, whichever the need. This technology is energy saving. The only exception is our study hall, where the heat coming off the computers is so high, that it requires extra cooling. That is why this hall is situated on the north side and has a cooling ceiling. Download the full story het gebouw van TU Delft Library (PDF).